Please select option for Alternative Apparel "The Champ" Eco Fleece - White and Red. Please select option for Alternative Apparel Lazy Day Pull Over. 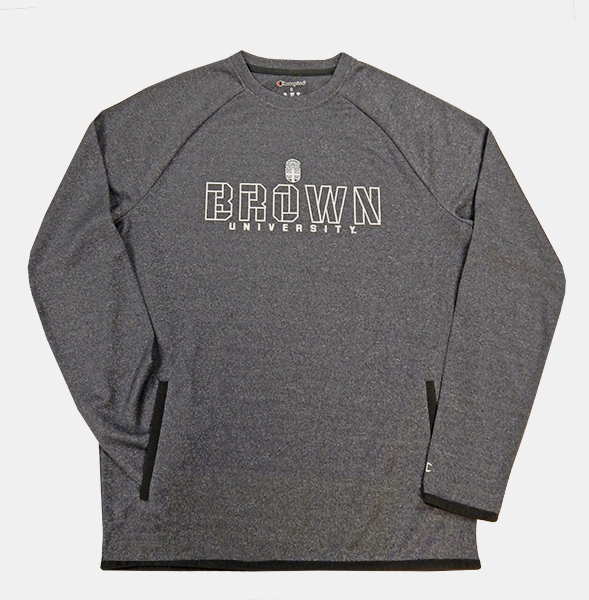 Champion 80% cotton, 20% polyester, light grey crew sweatshirt with dark grey sleeves and charcoal ribbed trim at neck, end of sleeves, and bottom. 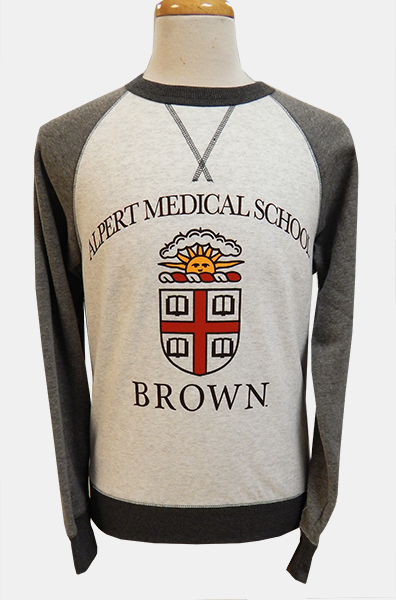 'ALPERT MEDICAL SCHOOL' imprinted in black above cardinal, black, and gold cutout Crest above 'BROWN' in black. Please select option for Champion AMS Grey-on-Grey Crew Sweatshirt - $47.99. 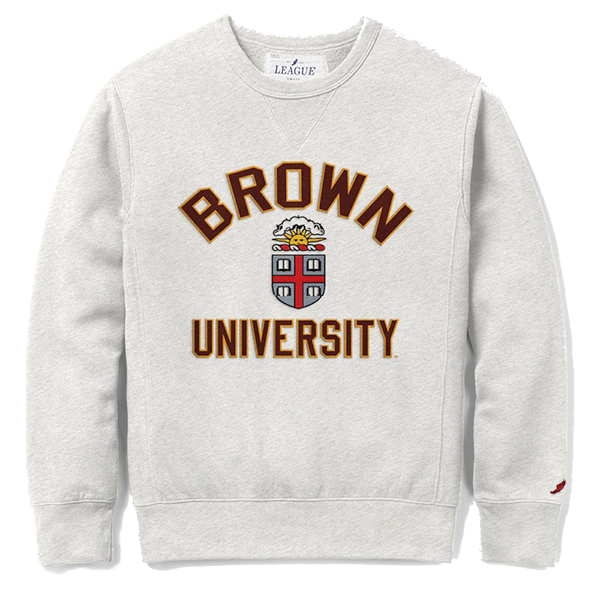 Champion 50% cotton, 50% polyester brown crew sweatshirt with 'BROWN' in sewn-on brown felt lettering with white felt outline; red, white, yelllow, and black embroidered Seal with brown embroidered outline, yellow wheat stalks with black embroidered outline; '1764' embroidered in red on white banner; and 'UNIVERSITY' embroidered in white. 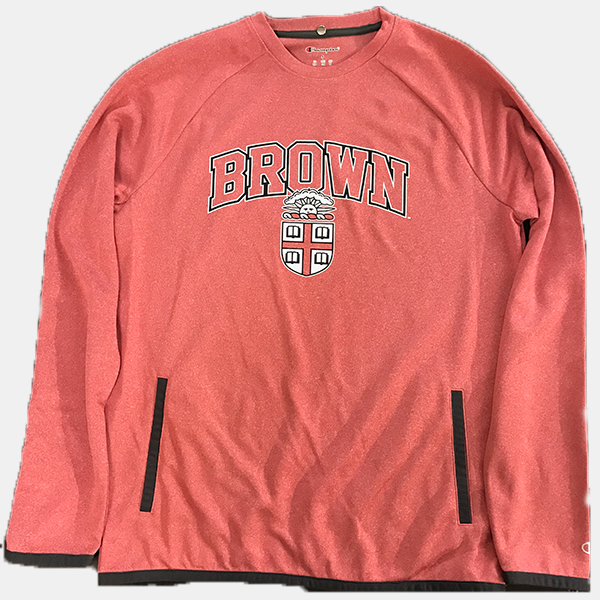 Please select option for Champion Brown Crest Crew Sweatshirt - $49.99. Champion 100% polyester, cardinal crew sweatshirt with charcoal ribbed trim at end of sleeves and bottom. Black and white outlined 'BROWN' text above cardinal and white Crest. Please select option for Champion Cardinal Crest Crew Sweatshirt. 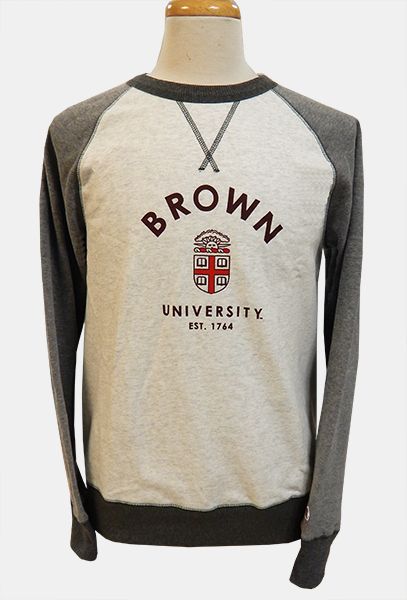 Champion 80% cotton, 20% polyester, light grey crew sweatshirt with dark grey sleeves and charcoal ribbed trim at neck, end of sleeves, and bottom. Cardinal, black, and gold cutout Crest above 'BROWN' in black. 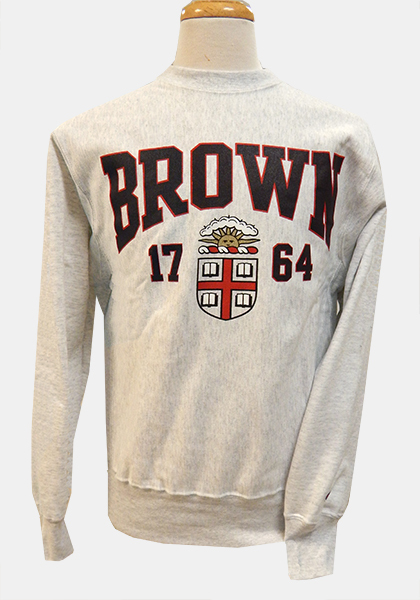 Please select option for Champion Grey-on-Grey Crest Crew Sweatshirt - $47.99. 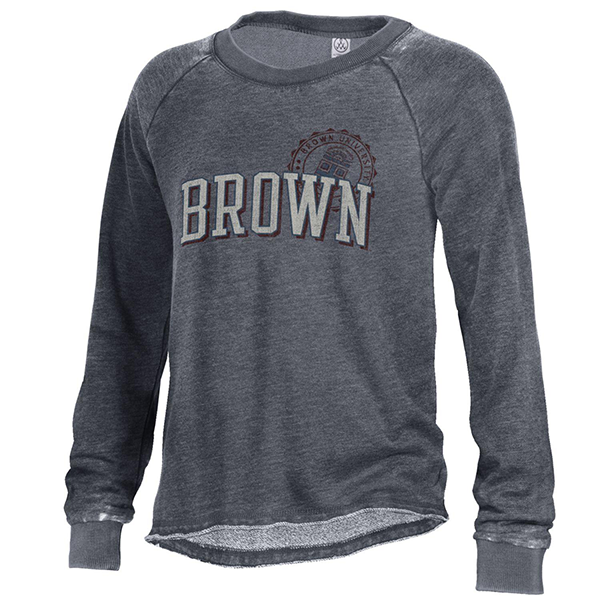 Champion 80% cotton, 20% polyester, light grey crew sweatshirt with dark grey sleeves and charcoal ribbed trim at neck, end of sleeves, and bottom. 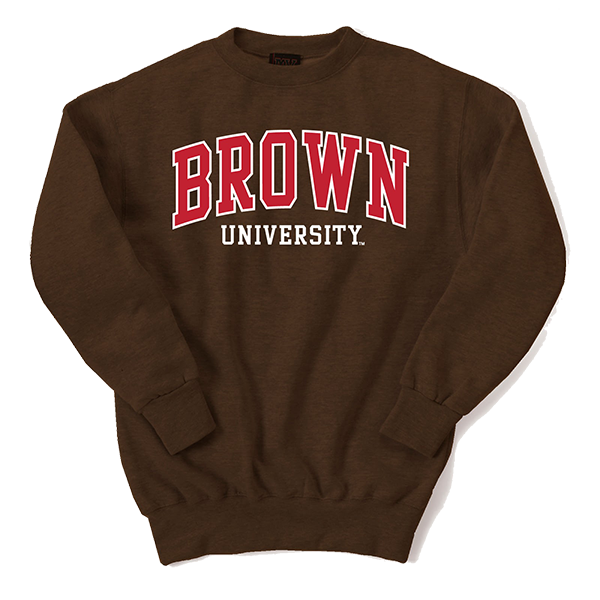 'BROWN' imprinted in brown above cardinal and brown Crest above 'UNIVERSITY' in brown. Please select option for Champion Grey-on-Grey Small Crest Crew Sweatshirt - $47.99. Champion 100% polyester navy crew sweatshirt with black trim at bottom, end of sleeves, and side pockets. 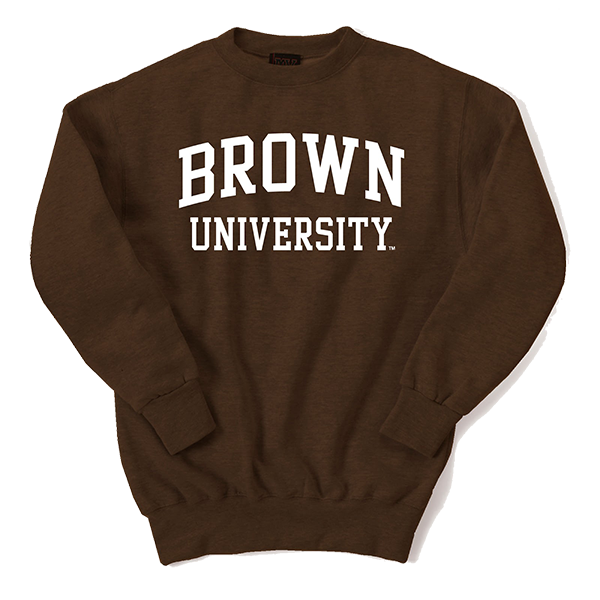 Crest imprinted in white above 'BROWN' in graphic block white letters above 'UNIVERSITY' in white. Please select option for Champion Navy Crew Sweatshirt - $46.99. 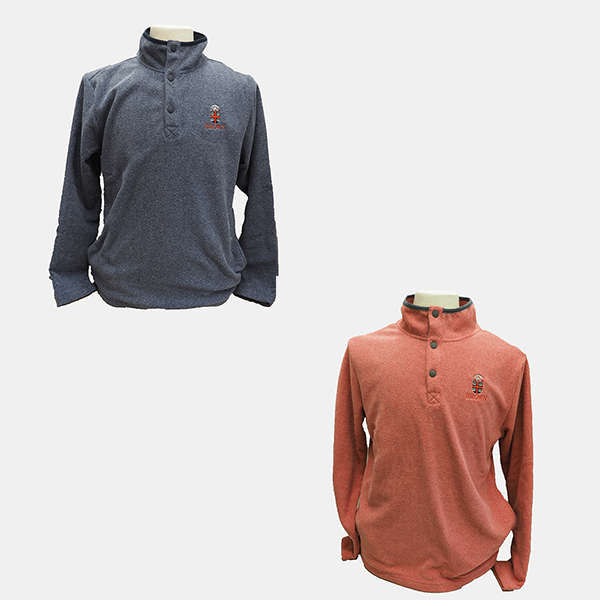 Please select option for Champion Powerblend Fleece Crew - Cardinal or Oat. Impress your friends and family with your **BAD** taste! 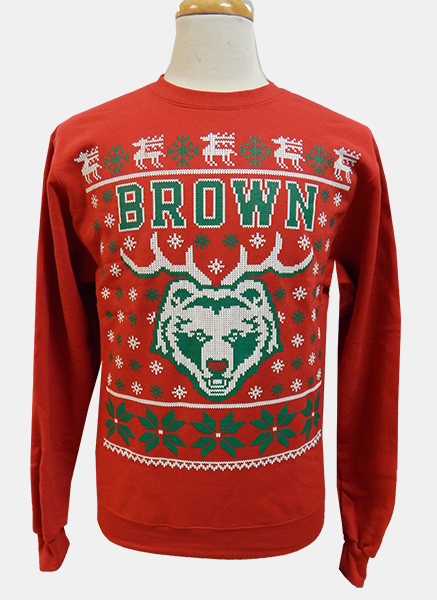 Champion 50% cotton, 50% polyester red crew sweatshirt with a Classic **UGLY** Christmas Sweater design in green and white and 'BROWN' imprinted in green with white outline and Bear mascot in green and white with antlers and a red nose. Please select option for Champion Red **UGLY** Christmas Sweatshirt. 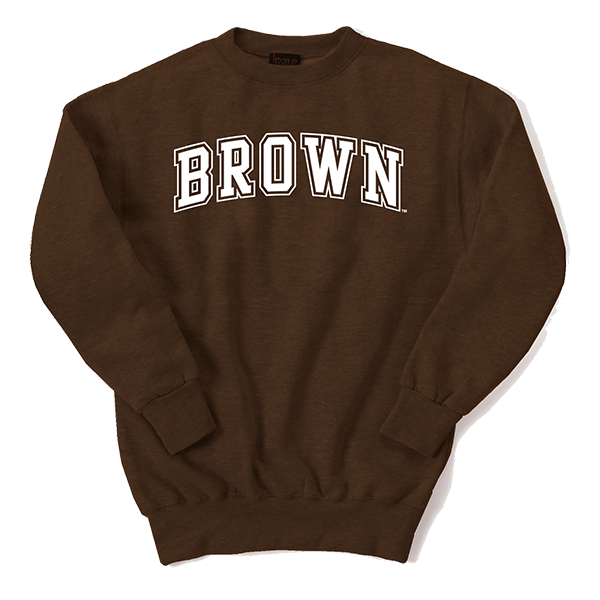 Champion 80% cotton, 20% polyester, reverse-weave crew sweatshirt with 'BROWN' in brown sewn-on fabric letters with white fabric outline. Please select option for Champion RW Grey Crew Sweatshirt - $59.99. Champion 81% cotton, 19% polyester body, 91% cotton, 1% cotton rib reverse-weave, light grey crew sweatshirt with ribbed inset on sides. 'BROWN' imprinted in dark brown with red outline above '1764' in dark brown with red ouline surrounding red, white, gold, and black Crest. Please select option for Champion RW Light-Grey Crest Crew Sweatshirt - $54.99. 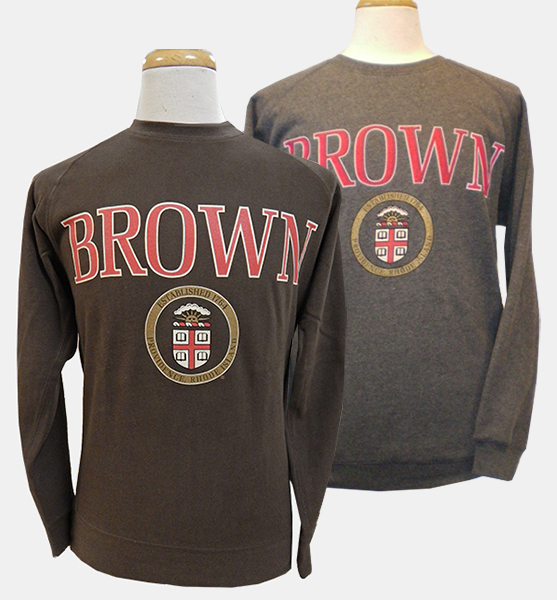 Champion Eco Collection, 50% cotton, 50% polyester, vintage crew sweatshirts have 'BROWN' in sewn-on fabric letters. 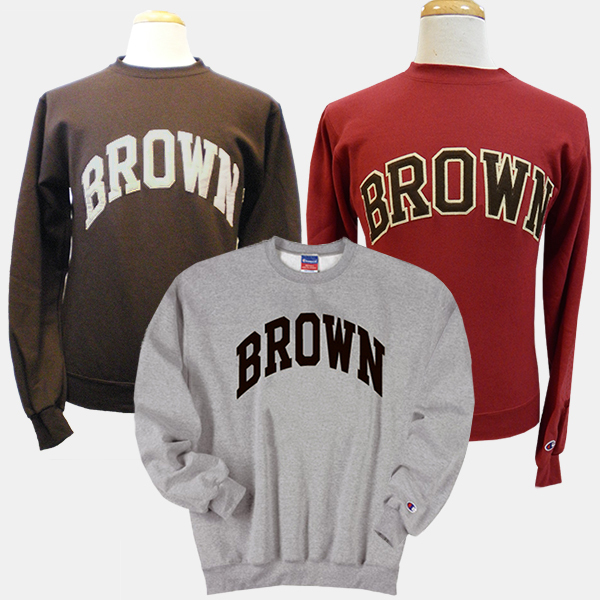 Brown Crew has off-white sewn-on fabric letters. Cardinal Crew has brown sewn-on fabric letters with off-white outline. 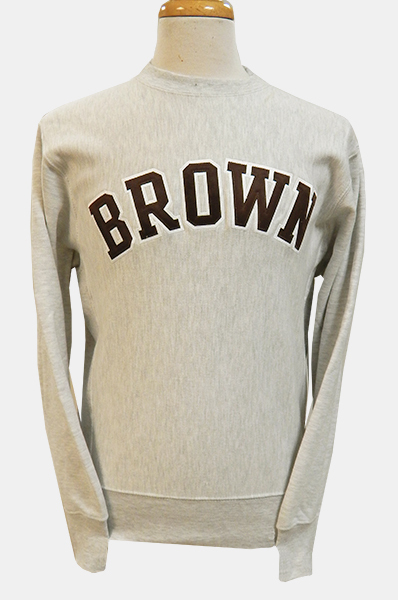 Grey Crew has brown sewn-on fabric letters. 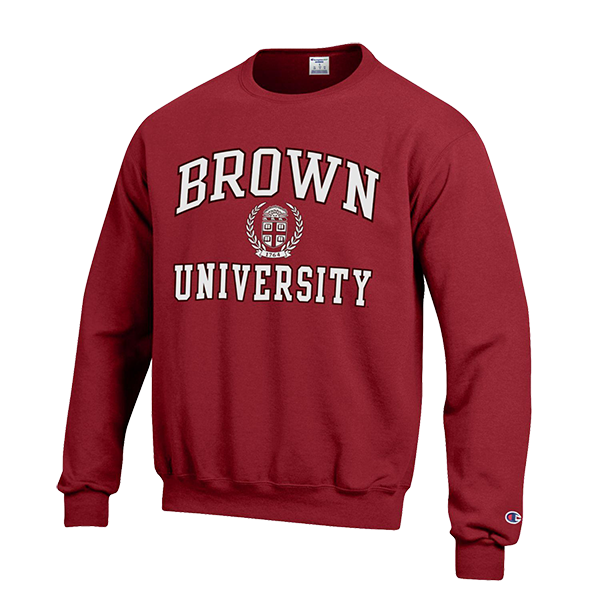 Please select option for Champion Vintage Crew Sweatshirts - $47.99. The perfect layer to cut the chill. Our Bayview Fleece is crafted from 100% polyester heathered fleece and features a convenient quarter-snap placket, allowing for easy on-andoff as well as quick temperature regulation. Pockets are conveniently incorporated into the side seams. Contrasting color on neck binding and inside placket add a pop of color. Please select option for Charles River Men's Bayview Fleece Pullover - $49.99. Charles River, 60% cotton, 40% polyester. 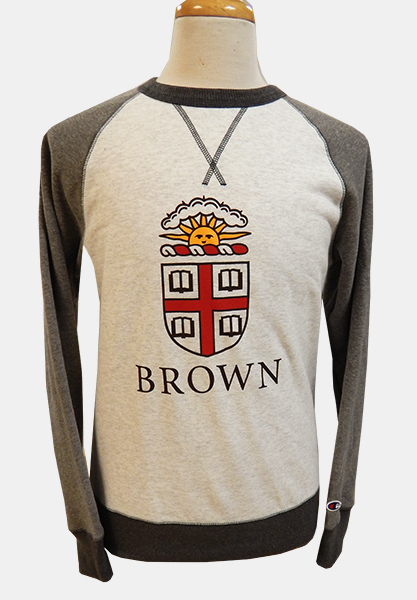 Men's: Handsome, collegiate character defines the Falmouth Pullover. The 60% cotton/40% polyester French Terry blend offers up rich texture and ample warmth for brisk morning excursions. A convenient quarter-snap placket with snaps allows for easy on-and-off as well as quick temperature regulation. Low-profile see-seam pockets. Women's: Sporty, collegiate character defines the Falmouth Pullover. The 60% cotton/40% polyester French Terry blend offers up rich texture and ample warmth for brisk morning excursions. A convenient quarter-snap placket with gunmetal snaps allows for easy on-and-off as well as quick temperature regulation. Pockets are cleverly incorporated into the slimming princess seams. 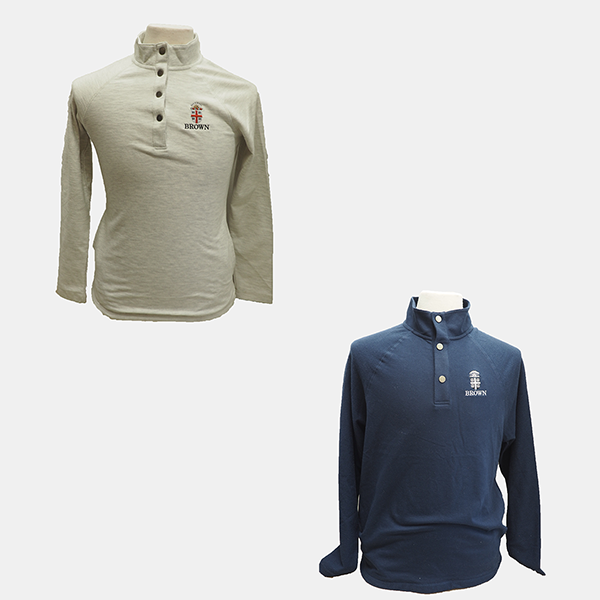 Please select option for Charles River Men's Falmouth Pullover - $48.99. Gear 80% cotton, 20% polyester, light grey crew sweatshirt. 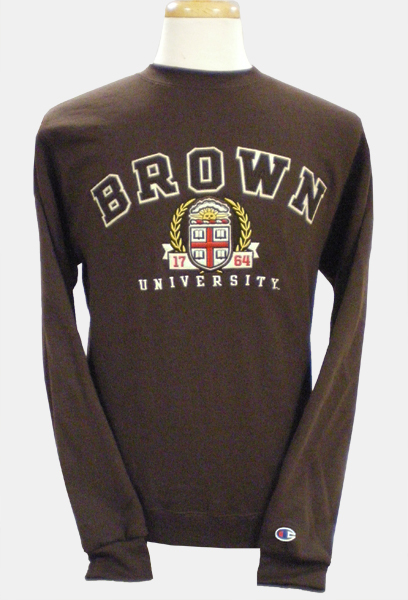 'BROWN UNIVERSITY' imprinted in brown above white cutout Crest with '17' on right and '64' on left. 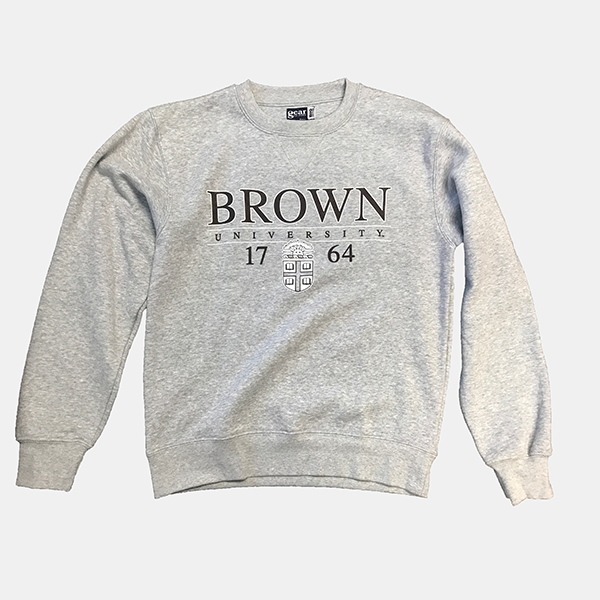 Please select option for Gear Big Cotton Grey Crest Crew Sweatshirt - 47.99/49.99. Gear, 67% cotton, 33% polyester, cardinal crew sweatshirt. 'PROVIDENCE, RI' in black imprint above 'BROWN' in white text with cardinal and black outline, above Crest in black and white with '17' and '64' on each side in black text. Please select option for Gear Cardinal Crest Est. Crew Sweatshirt. Please select option for League Stadium Crew - Oatmeal. Please select option for MV Pro Weave Brown Crew - Arched. Please select option for MV Proweave Crew. Please select option for MV Proweave University Crew. 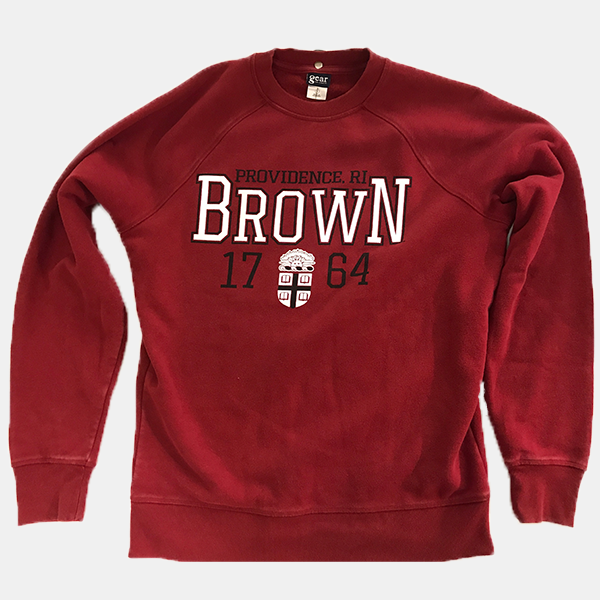 Ouray 60% cotton, 40% polyester crew sweatshirt with 'BROWN' imprinted in red letters with white outline and red, white, gold, and black Seal with 'ESTABLISHED 1764' and 'PROVIDENCE, RI' surrounding Seal in gold circle with black outline. Please select option for Ouray Seal Sweatshirt - $47.99. 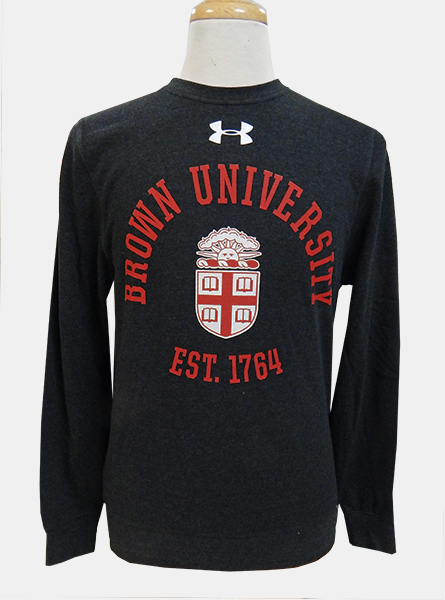 Under Armour, loose-fit, coldgear, 56% cotton, 35% polyester, 9% rayon, black crew sweatshirt with UA symbol imprinted in white above arched 'BROWN UNIVERSITY' in cardinal above cardinal and white Crest above 'EST. 1764' in cardinal. Please select option for Under Armour Black Crest Crew Sweatshirt - $59.99. 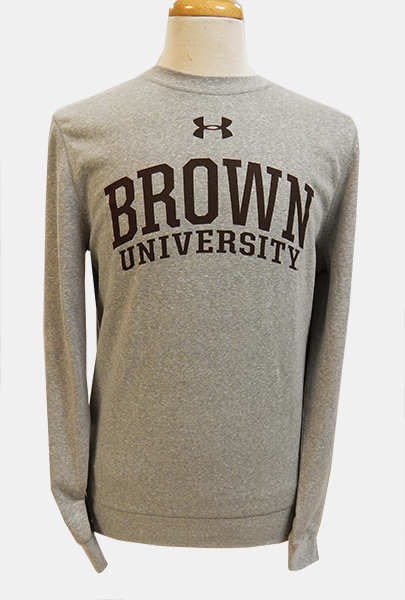 Under Armour coldgear, loose-fit, 56% cotton, 35% polyester, 9% rayon, grey crew sweatshirt with UA symbol imprinted in dark brown above 'BROWN' in dark brown above 'UNIVERSITY' in dark brown. Please select option for Under Armour Grey Univ. 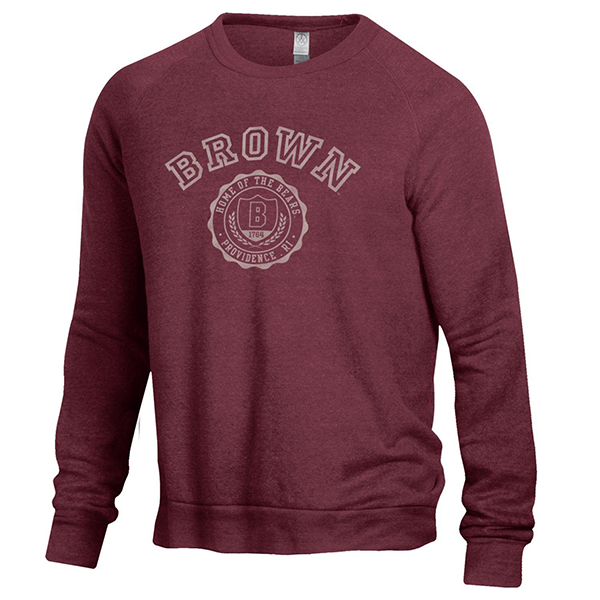 Crew Sweatshirt - $59.99. 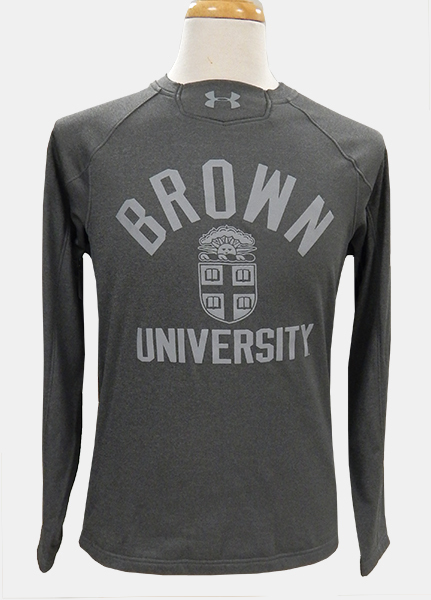 Under Armour coldgear, 100% polyester, loose-fit, grey crew sweatshirt has UA symbol imprinted in grey at neckline and 'BROWN' above Crest above 'UNIVERSITY' imprinted in grey. Please select option for Under Armour Grey-on-Grey Crew Sweatshirt - $69.99. 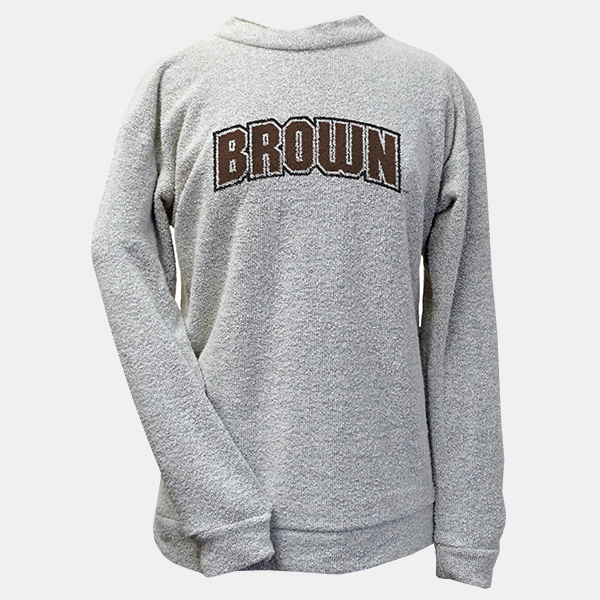 Woolly Threads 80% cotton, 20% polyester, reverse-loop, oatmeal crew sweatshirt with 'BROWN' imprinted in brown with white and black outlines. Please select option for Woolly Oatmeal Reverse-Loop Crew Sweatshirt - $64.99.